The global wireless M2M market has felt the impact of the economic downturn in the past year. Hardware manufacturers have suffered from shrinking margins as volume growth has flattened out at the same time as prices have continued to fall. Falling demand in the automotive sector caused by the sharp decline in vehicle sales has not been fully compensated by resilience in other sectors. Network service providers have fared better and still enjoy high growth for M2M connections even if the rate of increase has slowed down in several markets. The steady increase in M2M subscriptions is starting to generate substantial revenue streams for large mobile operators even if the typical monthly ARPU is just a few euros. 2012 will be a positive year for the global wireless M2M market with hardware shipments returning to growth and a continued increase in the number of network connections. New M2M initiatives launched by major mobile operator groups are expected to have a positive influence on demand, stimulating more new large-scale projects. Regulatory developments will have a major impact on the telematics industry. 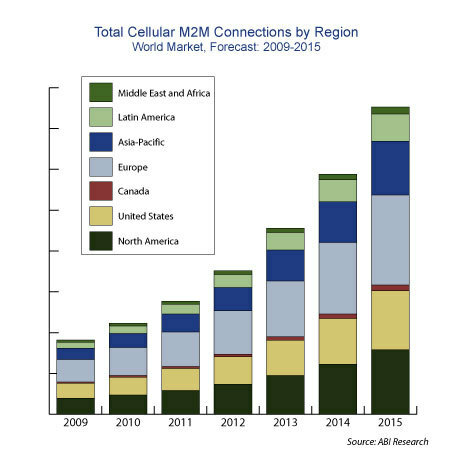 The cellular M2M connectivity service market grew at a robust 26.2% in 2011, rising from 87.7 million cumulative connections in 2010 to 110.6 million cumulative connections globally in 2011. Despite the continuing global economic crisis, the cellular M2M market benefited from increasing numbers of mobile network operators launching M2M service offerings as their core voice/data services market grows increasingly mature and saturated. The outlook for the coming five years is positive, although the weakness of the world economy has reduced the prospects for growth. The main geographical markets for cellular wireless M2M are the EU and North America. As an example, in mid-2009, the US accounted for around 50 percent of the total number of M2M connections worldwide. The US has the higher M2M penetration of over a 5 percent of all mobile network connections due to the large installed base of OEM telematics systems. Likewise, strong growth, particularly in smart grid and automotive telematics programs, helped to drive overall cellular M2M connections and revenue. As mobile network operators have become increasingly central to the M2M value chain, MVNOs and other types of M2M connectivity services providers have had to become more innovative in their technology offerings and competitive strategies. It is expected that cumulative cellular M2M connections will rise to 364.5 million globally by 2016.